Are you currently raising goats or thinking about raising a few? Come to our free Goat 101 Meeting at Russell Feed & Supply in Azle on Tuesday, September 25th. We’re serving dinner at 6:30 pm followed by the meeting at 7:00 pm. Goats can be a great addition to your farm or to your family. Goats are a diverse species (milk goat, meat goat, backyard goat, pygmy goat, etc. ), but the basic care principles are consistent. 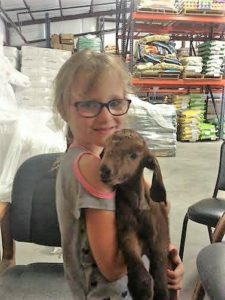 Whether you have goats now or are interested in learning more about them, bring your questions and your enthusiasm to Russell Feed & Supply’s FIRST EVER GOAT MEETING! RSVP in-store, online using by using the form below or give us a call at 817-444-8815 and let us know you’re coming. We look forward to hosting you on September 25th! This entry was posted on Monday, August 20th, 2018 at 2:24 pm	and is filed under Events, News & Updates, Show Animal, Small Animals. You can follow any responses to this entry through the RSS 2.0 feed. Both comments and pings are currently closed.